Technical details for those technically inclined. Above dimensions are in inches. Screw holes are meant for 4-40 screws. The antenna is 4.1" (10.5cm) long, and is foldable/adjustable. The Axon Mote has two main power configurations. The default battery configuration requires only one battery to operate the Axon Mote. All Axon Motes are manufactured and shipped in this default configuration. You can also attach additional batteries in parallel on the unregulated battery bus (all batteries must be the same voltage, battery type, and charge level) as needed. Simply plug your battery into BAT, and your Axon is ready to go. The dual battery configuration allows you to use a small stable battery for powering sensors and the ATmega128RFA1, while a much larger less stable power supply can be used for motors and/or servos. In this configuration, the battery meant to be regulated goes on the BAT header, while the other battery goes anywhere on the unregulated battery bus. To enable this configuration, flip over your Axon Mote and remove the small solder trace between BAT and E5. This trace acts as a high-current jumper. With either main power configuration, you have two additional power options. The USB power configuration lets you power your Axon Mote straight from USB. 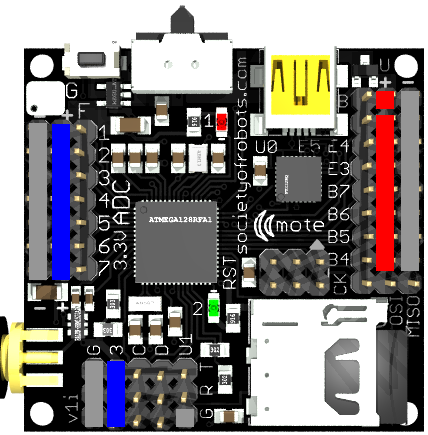 USB allows you to draw up to 0.5A, about enough to power your Mote and a single servo. If you plug in a battery and USB at the same time, the Axon Mote will automatically draw power from the source with the higher voltage, while ignoring the other. The USB will *not* charge your battery, nor will it damage it. If USB is plugged in, you do not need a battery to power the Mote (the unregulated bus requires a battery to use). The solar panel configuration allows you to use a solar panel. The Axon Mote has all required electronics for solar power, so you can plug your solar panel *directly* into the BAT location. A solar panel rated at no less than 6V and 150mA is recommended. *DO NOT* plug a battery into a bus with a solar panel that does not have diode protection, as it'll damage your solar panel. 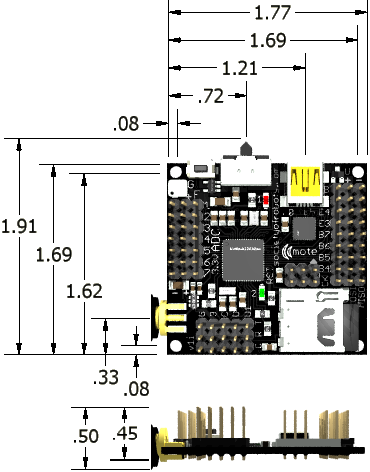 The Axon Mote is a 3.3V microcontroller, and digital I/O pins will transmit and expect 3.3V. Do not apply 5V to any I/O pin without a level shifter, as it could permanently damage it. Most electronics today are designed for 3.3V only operation, so this shouldn't be an issue. 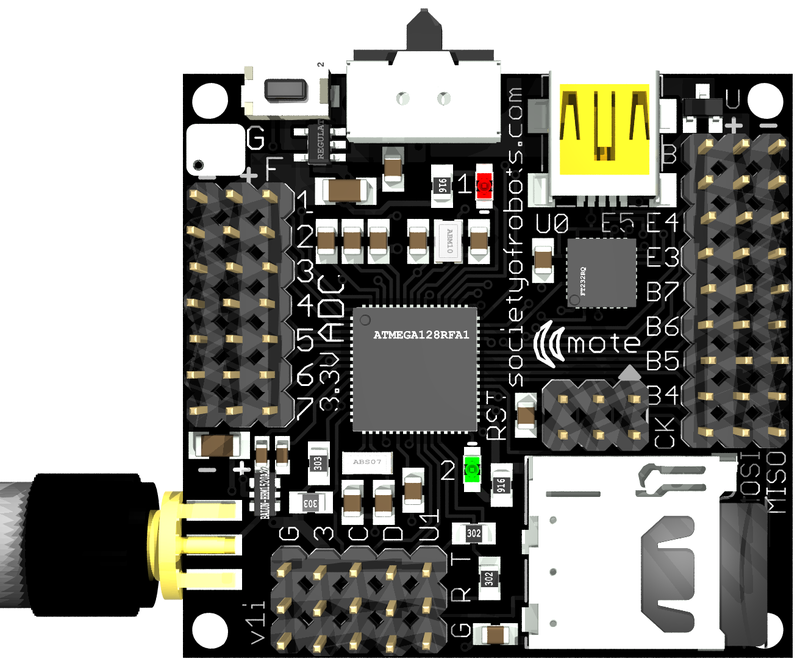 The Axon Mote UART, however, is 5V compatible. The ADC is 1.8V (not 3.3V or 5V!!!). Atmel in their infinite wisdom decided no one needs more than 1.8V for ADC, and designed the ATmega128RFA1 as such. In theory you can apply higher than 1.8V without damaging your ADC pin, but the value the Mote reads still maxes out after the signal exceeds 1.8V. On the Mote there is a jumper to let you operate the ATmega128RFA1 out of spec - at your own risk of potentially damaging it. 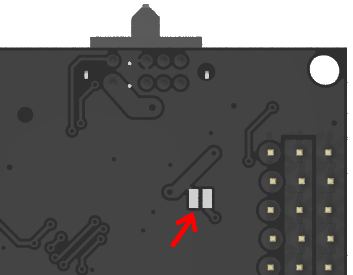 Flip your Mote over and solder the jumper as shown in the below image. This lets your ADC go up to about 2.7V but sacrifices some accuracy. I do this all the time and haven't had problems, but again, it's at your own risk. warning: Applying more than ~2V to the ADC will cause the Rx of the wireless transmitter to stop working. Some SharpIR rangefinders will output higher than 2V, so a voltage divider must be added to the sensor output. The single advantage to this low voltage ADC is that it gives you much higher accuracy when measuring very small signals, such as from force sensors. You are less likely to need an amplifier, too. Absolute minimum required power input voltage is 3.5V. If at any time the voltage drops below this amount, even for a milli-second, the Axon Mote could reset. The recommended battery voltage is 3.6V to 7.2V. 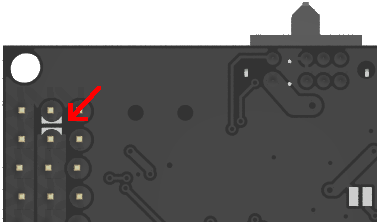 A 4.8V 1000mAh+ NiMH battery is recommended if you have servos with the default battery configuration. Voltages above 10V will cause the voltage regulator on the Mote to burn out. Note that most servos will have reduced lifetimes at voltages above ~6V and can quickly fail at voltages ~7.2V+. There are two power buses. ADC pins 1 to 7 and I2C headers are regulated at 3.3V, while all other pins are directly connected to your unregulated battery. The Axon Mote has polarity protection features, meaning that it is designed to protect itself if you accidentally plug your battery in reverse. However, it will NOT protect any external component(s) connected to the unregulated battery bus. The 3.3V power bus is NOT protected against polarity, over-voltage, or power surges. This is how the pins are set up in terms of power. All ADC power bus pins get power from the 3.3V LDO voltage regulator with maximum allowable current of 300mA. If the regulator overheats, such as from overuse or shorting, it will protect your Axon Mote by triggering a temporary thermal shutdown. The Axon Mote power busses can safely handle up to ~5.2A (calculated value, not experimentally determined). Placing your high current draw components nearer the battery can up this number. This limitation is entirely based on power bus tracing thickness, meaning that if you require higher currents you must make your own separate power bus. Using multiple batteries distributed along the power bus can reduce current across individual traces. Individual I/O pins can supply about ~20mA power, each. Exceeding this number could damage/fry the I/O pin. The Axon Mote has been designed to drain very small amounts of power at very high efficiencies, allowing it to be powered directly from a solar panel or last a very long time on a single battery. This is a list of current draw, depending on what how you program the Axon Mote, to help you estimate total power use for your project. A typical program using the wireless transceiver would be about ~21mA averaged (70mW power). Maximum possible sustained power draw is 250mW (regulated power bus). All electronics creates electronic noise and sudden voltage spikes/drops that can potentially cause problems. The Axon Mote has been intentionally designed to minimize this noise for ADC measurements. Attaching additional noise suppression ceramic capacitors in parallel with the power/ground of your external device(s) is recommend if you are using electrically noisy devices. The Axon mote has been tested at -12C (typical freezer temperature) and in a vacuum chamber. It has also been tested in space at 1% atmosphere and -3C. No failures detected. In addition to normal digital I/O functionality, some pins come with additional special features. Hardware PWM is perfect for creating a perfect high frequency squarewave without any cost to the processor. Servos using hardware PWM can only be used on 16 bit pins, while regular DC motors can be used on any PWM pin. The UART is great for sending and receiving serial data, such as from a GPS, a camera, external memory, other microcontrollers, etc. The ADC, or analog to digital converter, is great for reading in analog sensor data (Sharp IR, photoresistor, accelerometers, gyros, etc). External interrupts are useful for triggering interrupt code when important external events occur. Use these for encoders, sonar, and other time important sensors. Some devices require SPI to communicate. Pins are labeled CK (clock), and MOSI/MISO. The uSD card also runs on SPI, and it already has a resistor. Your external devices will need a resistor to work with the Axon Mote. Some devices require I2C to communicate. There are three I2C headers, each with it's own ground and 3.3V power bus pins. D is for Data and C is for Clock. Without cutting power, the Axon Mote can be reset by a software command (see example programs) or manually. 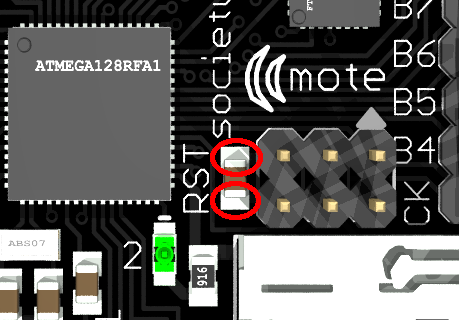 To manually reset the Axon Mote, short the two pads across this resistor where it says RST. See below image. Feel free to contact me if you would like to share your CAD files for the Axon. If you'd like to create your own CAD, feel free to download the Axon Mote texture image. If you have other CAD designs of the Axon Mote, let me know! Societyofrobots.com makes no representations or warranties with respect to the accuracy or completeness of the contents of this document and reserves the right to make changes to specifications and product descriptions at any time without notice.